Filled with Fullness: Does God get better at stuff? The feasting season is here. I love the idea of good food with good friends and family. But I have to admit something: I haven’t always taken full advantage of Thanksgiving. 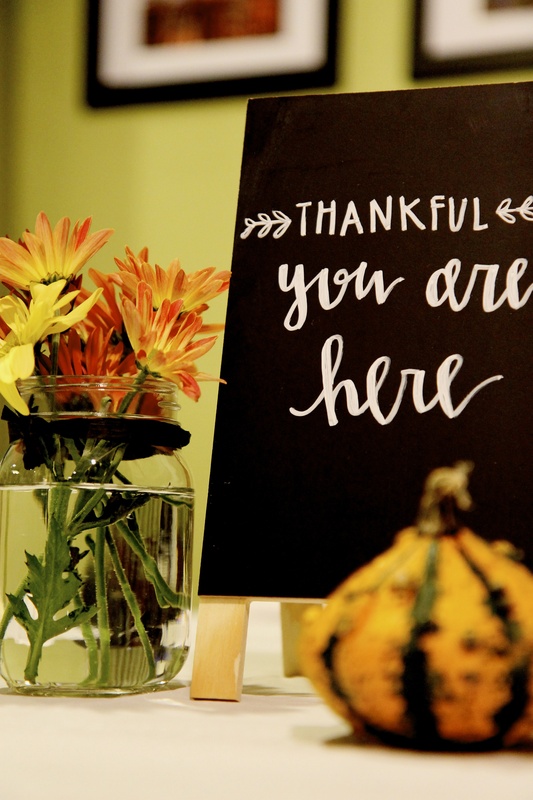 I imagine there are tons of blogs and pinterest boards that will help us create the ultimate table setting and cook the most creative dishes. 1. Eat slowly – I don’t want to rush through the meal that takes so much planning and all day to prepare. I don’t want to hurry past the conversation that might happen during one of the few times my family gathers. Instead of shoveling it in, racing to dessert, and then catching the game on TV, I’m going to try to slow down and savor. 2. Listen attentively – This year I’m going to focus more on listening than talking, which means I’ll need to ask more questions, too. I want to be attentive to what’s going on in the lives of my family and friends. 3. Laugh loudly – I really hope someone at the table laughs so hard that turkey and dressing fly out of their mouth! And I hope that person is me! Laughing is awesome. I don’t care if that’s too simple to say. Who doesn’t like to laugh? So tell some stories while you’re eating slowly. And when the laughter gets going, make sure your mouth is full! Earlier this week I shared my discovery that Christmas without Christ is just mas, and that just means more. Now don’t get me wrong. I won’t argue with more eggnog, more Home Alone, and more Netflix fireplace on my TV screen. I love the lights, the food, the music. I just don’t want so much of it that I’m too full to point my family to Jesus. 1. 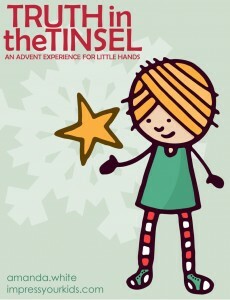 Truth In the Tinsel – This daily advent devotional is great for families with little ones who are old enough to help with crafts. Each day there is a Scripture reading, a few conversation questions, and instructions for creating an ornament. If you like decorating your tree with homemade ornaments from the kiddos…this one’s for you! If you buy the e-book ($7.99), you’ll get the devotional along with all the directions and lists of supplies. My daughters loved it, and it made it easy for us to have fun family time almost every night throughout the month of December. 2. 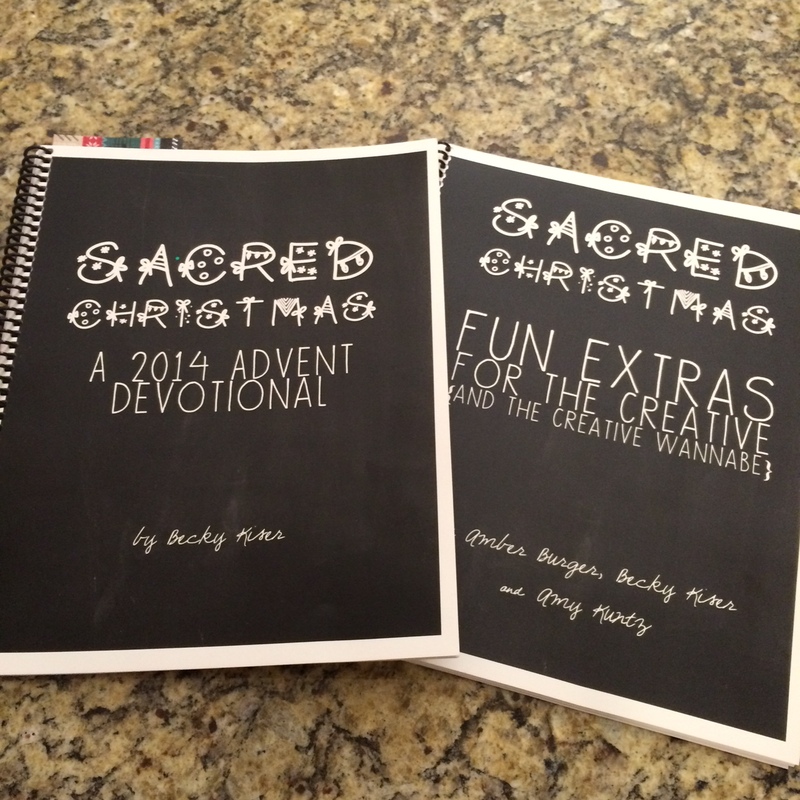 Sacred Christmas – We’re test-driving this new advent devo this year, and I’m really excited about it! The devotional looks like it may be more for the adults, but we haven’t done it yet so I can’t say for sure. However, I spent a little more $$ ($35 total – but a % of the proceeds go to clothes for Sudanese Orphans) and bought the “Fun Extras.” Just flipping through it got me pumped! There are some great ideas for activities to do with the kids each week. There are also sections on decorating, entertaining and cooking during the holidays. I’ll post more about this as we get into it. 3. We Killed Santa – But we killed him softly, I promise. 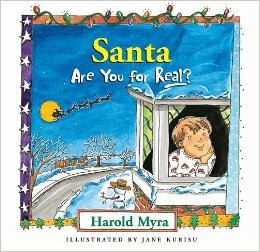 We gathered our kids and read a book called, Santa, Are You For Real, by Harold Myra. This short board book tells the story of St. Nicholas and his heart for giving gifts. It helped us point our kids to the ultimate gift-giver, God, who gave his Son, Jesus. We still love Santa as a symbol of gift-giving, and we’ll still get the kids’ picture taken with one of his minions at the mall as long as the grandparents will pay for it. 4. We have a new gift strategy – You probably have your own. Maybe you give 3 gifts because that’s what the wise men gave Jesus. I’m allergic to frankincense, so we went with this: Our kids get four gifts from us: something you want, something you need, something to wear, and something to read. Now they know what to expect, and it protects me from going overboard, which I would totally do because I love giving tons of presents at Christmas! Now we can be more generous to others, have people in our home, and look for fun ways to bless friends and neighbors. There you go. Four ideas to help you get a little more Christ this Christmas. We are always learning. I bet you have some great ideas, too. Feel free to leave a comment and share your ideas! This Christmas, What ‘More’ Could You Ask For? Four years ago , I was flipping through my journals looking for something that would spark a sermon idea. Our church was heading into the fray of the holiday season and I needed a little inspiration. For at least three of the past five years there was a gap in my journal entries during the first three weeks of December! Nothing. No stories. No thoughts. No prayers. No Scripture. Not even the date on the page. I let the craziness of Christmas cut Christ completely out. Take a look at the word Christmas. If you cut Christ out, all you’re left with is mas. My Spanish-speaking friends know that mas just means more. Without Christ…Christmas just becomes more. It starts by coming up with a plan, a strategy, a manifesto for getting mas Christ this Christmas! On Tuesday, I’ll share a few ways my family has done this the past few years. Until then, take a minute to think about what you really want this Christmas season. I have three daughters, which means there has always been a high probability that at some point I would find myself in an American Girl Doll store. I’ve actually been in two, but that’s a story for another day. And because I’m a dad, and an American, and a Christian…I love me some Chick-fil-A. So what did I learn from these two businesses that might not be visible on the surface? 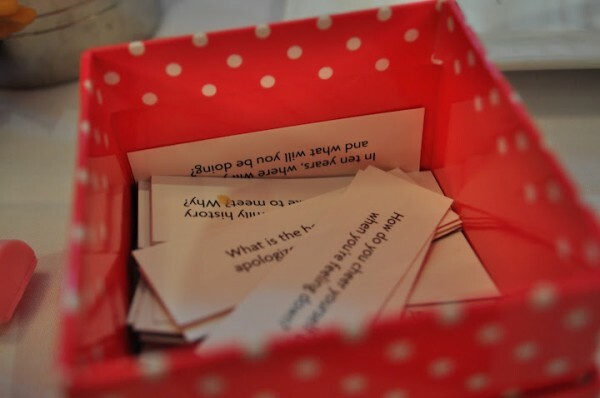 On the table there was a box full of fun questions – conversation starters. Of course this is brilliant from the restaurant’s perspective – keep the patrons busy while they’re waiting! But it did something more. The questions got us engaging as a family. We practiced listening to one another. We laughed at each other’s answers. We talked about what we would name our horses, if we owned them, and what one word we would use to describe ourselves. I know a lot about my kids; I know how I would describe them. But it was fun to see how they see themselves. American Girl gets it. Get families talking around the table. It’s fun. It’s incredibly healthy. It gives us parents a tool to be intentional, instead of getting sucked into our phones to see what other people are eating or doing. Chick-fil-a gets it, too. Every year the local CFA has a Daddy-Daughter Date Night. They do a great job with this, and they take it all the way to the detailed level of the placemats at your table. On those pieces of paper that will soon be covered in chick-fil-a sauce there are conversation starters to help dads be intentional with their little girls (even if they’re not so little anymore). The questions are simple, but they get the ball rolling. All this gets me thinking about the opportunities I have each week. We try to eat together as much as possible. We’re busy just like you. So when we get together around the table, I want to be intentional. I don’t want to be satisfied with one-word answers like “good. ok. fine.” And I don’t want the meal to just be about getting my kids to eat (if you have boys, you probably don’t have this problem). So let’s spice it up a little bit. Ask some fun questions like “Would you rather have shrimp for pinky fingers or really hairy elbows?” I bet there thousands of Pinterest pages about this, so just google “conversation starters” or sit down and make up your own questions! But just to throw you a bone, here’s a mom who made her own and offers to send you all the questions! BTW…this works for your spouse or your significant other as well! Be done with dull dinners! As I said earlier, this is pretty intuitive and maybe you get this already. But this dad needed a reminder to be intentionally pursuing my kids. We have so many battles ahead of us, so my relationship with them is mission critical. So, all that to say…I can’t wait for dinner tonight. I love stories. Don’t you? And I want to live a life full of great stories. Don’t you? “Daddy, will you tell me a story?” That was my 9-year-old daughter, who snuggled up to me on a Sunday afternoon. “No, not right now.” That was me, dad-of-the-year. I couldn’t tell her a story because I was busy. I was watching a football game between two teams I care nothing about. Way too busy. Actually, I didn’t think much about it at the time. I wasn’t mean or rude. I was just tired. And she went on with her day. But the next day I was mowing the grass, and I was thinking about stuff. 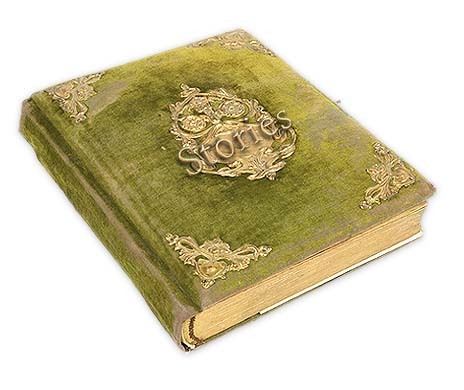 I was thinking about how I love stories. There are so many days when I’d love to come home, lay on the couch and be swept away by an epic movie with a hero who battles and overcomes and emerges victorious. My daughter wanted to be swept away, too. She wanted her daddy to tell her about a princess who loved to dance and explore the world with her princess sisters. That would have been a grand story! But I was caught up in a much smaller story. My little story was about one person who never left the couch. Every Sunday morning I gather with a team of people in an elementary school library to pray. Our church meets in a school. If you think that’s weird, read my friend Chris’s take on it. 1. I’m just a 35 year-old kid! I love adventure and I love stories and I want to live in that magical kingdom! 2. It reminds me that as a pastor – more accurately, as a man who follows Jesus – I get to invite people to see themselves in an epic story – God’s story. A true story. I haven’t always lived for the bigger story. The smaller stories distract me. By smaller stories, I mean the ones about trying to be popular, trying to get a lot of facebook likes and twitter mentions, committing lots of emotional space to my sports teams, finding the right haircut…stuff like that. Sometimes the small stories offer a taste of meaning and adventure, but most of the time they aren’t big enough. Thankfully there is a story large enough to capture my soul. It’s the story about a gracious God who is pursuing prodigal people – like me. And when I’m willing to let myself get caught up in this story, I experience what all those smaller stories can’t offer; I experience real life – the life that comes from snuggling up to a little girl and then whisking her away to a distant (but maybe not so far-off) land where she is a princess of great beauty and talent. Yeah. That’s way better than zoning out watching a game between…well, I can’t remember. So what story will you live today? So at the church office we have a neighbor who lives across the street. His name is Bob – I think. Bob is always outside doing something random, and he’s always yelling greetings to us (even though I can’t really understand him)! Bob came over the other day while a couple of us were having a meeting. He didn’t have a shirt on, but he came on in and sat down with us. He was having trouble getting his new TV remote to work. Chris (our lead pastor, my partner in crime) has been exchanging greetings with Bob across the street for a year now; he’s done a great job loving Bob. So Chris took the remote control and started working on it. The context of Bob’s story told me that this man probably claimed to be a Christian but never talked about Jesus. And this man may have hurt Bob at some point along the way. I’ve been thinking a lot about what shirtless Bob said that day. Jesus is the reason I live in Chattanooga now. Jesus is the reason I have purpose. Jesus put up with a lot of junk in my life and didn’t give up on me. But I’ve been struck by how seldom I mention Jesus in conversation with people outside of my safe church context. Why is that? Chris fixed Bob’s TV remote. The batteries were just in backwards. And Bob gave me a gift – an encouragement to be a man who mentions Jesus. The Teague family decided to take advantage of the price cut and snag a Nintendo Wii this Christmas! Annie loves to bowl and play Mario Kart! Katie is a champion sword fighter! I’m trying to beat 24 on the 3-point challenge, and I enjoy inviting Chris Jessen over to whip him in table tennis. We love Sports Resort and Mario Kart, but I’m looking to add a couple more games to the repertoire. The challenge is that I’m not much of a gamer and we are brand new to the Wii community. So…anyone want to recommend some games?